It's the Google Nexus S. In white. How exciting. 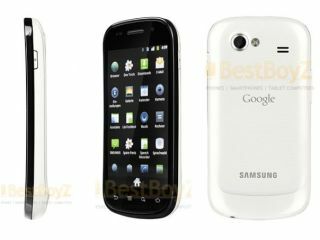 In an entirely classy move, Google looks set to release a white version of the Google Nexus S.
The Samsung-made smartphone is in no way (read: in all ways) cheapened by its white makeover, which highlights the typical Samsung curves that will forever remind us of the cheap and cheerful Genio range. It's not a complete whiteout for the Google Nexus S, though, with the front panel remaining stoically noir. We can't see much reason for the white-over to be honest, other than for Google to bite its thumb at Apple for the latter's seeming inability to bring a white iPhone 4 to market. There's no official confirmation from Samsung on whether we'll see a UK release date for the pale and pasty handset, which surfaced on German website BestBoyz earlier today. We'll be keeping an eagle eye out for the snow-white Google Nexus S at Mobile World Congress 2011 especially for you, colour-variant fans.